Get the perfect fit and features with The Zoom Rolling Walker. 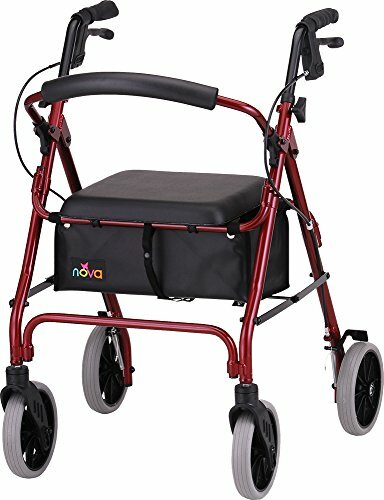 NOVA’s signature rolling walker is designed for optimum stability and the best of the best in features and style. Features include 8" wheels, an under seat pouch, a padded seat, our patented feather touch hand brakes, flip up back, and self-threading height adjustment knobs and the Lock n’ Load. The Zoom comes in 4 seat heights: 18”, 20”, 22”, 24” for the perfect fit. The beautiful metallic paint finish gives the Zoom a luxury look and is very long lasting. The Zoom has a Lifetime Limited Warranty on the frame and 5 Warranty on the Brakes. Call NOVA at 1-800-557-6682 with any questions or email us at service@novamedicalproducts.com.